I recently completed a long-standing personal quest. A couple of years ago I acquired a military dial for a Korean War-era Hamilton military watch. It started a personal mission to match this lonely dial with a correct military watch and put it back into service. Turns out, that was harder that I thought it would be. As in WWII, Hamilton made military watches for the Korean war - but strictly for the United States Marine Corps it seems. 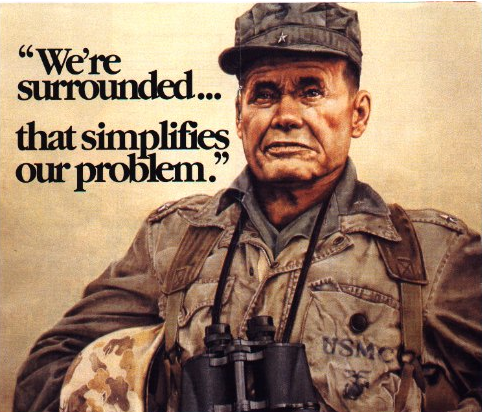 Now, I don't know if Chesty Puller wore a Hamilton watch - but I wouldn't be surprised if he had. Lt General Puller was a "Marine's Marine" and by the time he retired from the Corps he had earned more awards than any Marine in history, including five Navy Crosses. 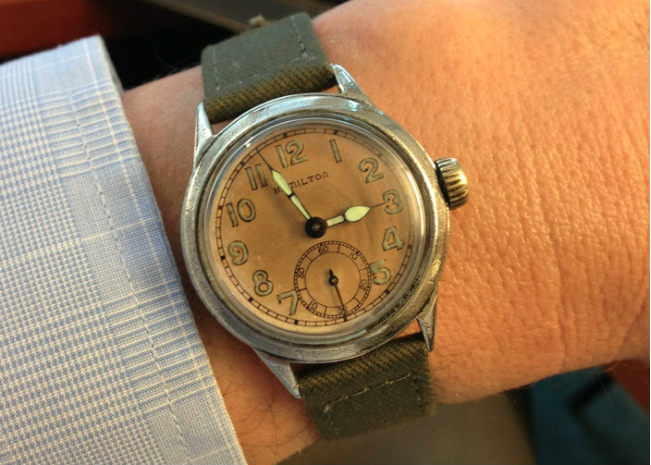 The USMC Hamilton watch looks familiar to WWII-era watches but the dial is slightly more refined and the movement is an 8/0 sized, 17 jewel 747 movement. Those differences are why it took so long to complete this project. The case is a rugged parkerized case with a screw-on back made by the Star Watch Case Co. 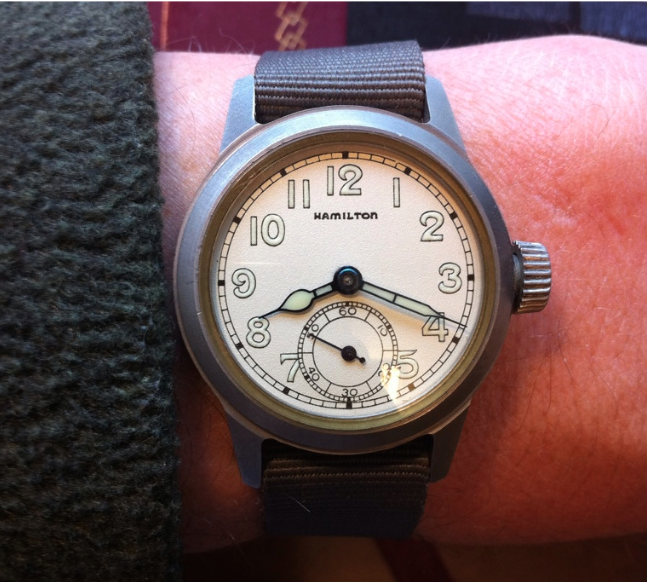 The parkerized case was introduced at the end of WWII with the 987A movement. If you compare the newly completed USMC watch above with a WWII-era watch below, you will see the numerals on the WWII watch are a little larger, the seconds track is more detailed, and the chrome plated case has slightly more tapered lugs. 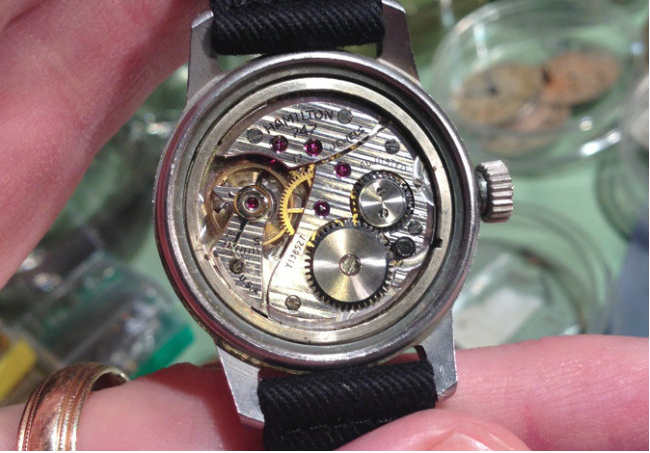 The WWII watches used the larger, 6/0 sized 987A movement (or the 987S / 2987 for sweep second models). Parkerized versions of the WWII watches were introduced near the end of the war. The chrome plated watches were prone to wear and the case was redesigned. Other than the dial pattern, the main difference between the watches is the movement ring has to be thicker to incorporate the slightly smaller 747 movement. In addition, the stem for a 747 is a "Tap 10" thread and thinner than the "Tap 8" thread for a 987A movement - so the crowns for the two watches are slightly different. Here's a movement shot of the 747 inside the case. There's a rubber gasket inside the circumference of the case and a dust cover goes over the movement ring before the case back is screwed on. So why did it take so long to complete my personal quest? Well, these watches are relatively hard to come by it seems. You can find the cases with some frequency but not the movement rings and matching tap 10 crowns. I could find already-completed watches - but my goal was to utilize the dial I had purchased - so I needed to find just the right project watch in need of some TLC. Good work Dan! Random question but did Hamilton produce any sweep second hackable military watches during the Korean War era (like the 987S in WW2)? Not that I'm aware of. 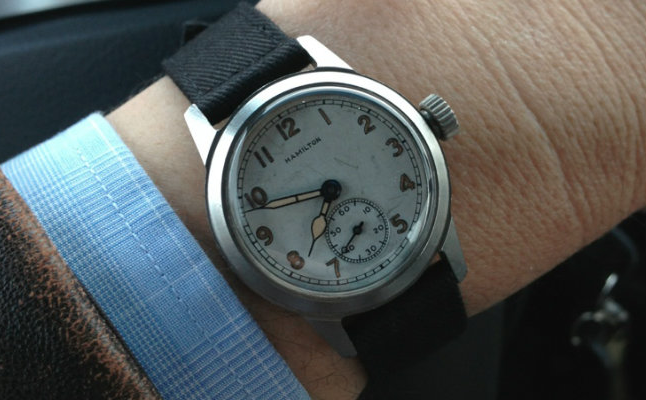 I believe there were similar watches with sweep second hands and black dials that used the 18J 748 movement. Same 8/0 size set up and they did not hack. I want to say that was after Korea though... say the mid 1950's. Pretty uncommon to see one though. Then in the 1960's new military designs were introduced that featured Swiss movements and some (not all) had a hack feature. There were also European military models. There are a lot of Vietnam-era fakes out there though, so caveat emptor when it comes to Swiss-movement military watches. Thanks Dan. I wouldn't mind getting hold of one of the Hamilton W10 (Army) or 6BB (RAF) watches from the 70s one of these days. I'm not really sure of the provenance of these though, being post 1969. Hi Dan, Love your watches. I just wanted to ask if you knew wether Bulova utilised this case in 1945/46 with the 10AK movement? (fig.165-166) is the one used, but I have seen claims that the ORD CORPS OF configuration used this modern stainless parkerized case also. I'm not really sure to be honest. I know the Elgin case was a little different as I tried to stuff a Hamilton into it and it would fit right. I'm not sure about a Bulova case. They could be very similar and just have different movement rings but, to be honest, I don't really know.